The pizza was delicious. It was May 2014, and the content marketing team was celebrating the one-year anniversary of its digital magazine for one of the most prestigious financial services brands in the world. By all accounts, every goal had been met. It launched on time and only slightly over budget. The audience was growing steadily, and the sales group loved the insight and new opportunities that the magazine produced. Content marketing was a hit at the firm. The following week, the team learned the new vice president of digital worked with the CIO to institute a new “One Site 2015” initiative. The company was to centralize all blogs and microsites into the main corporate website and integrate it into the main enterprise CMS. The content marketing director desperately pleaded his case. Re-platforming the magazine’s WordPress site and Google Analytics into the enterprise CMS would take months and hundreds of thousands of dollars. And, it wasn’t even clear that there would be any benefit. The content marketing team spent the better part of six months re-platforming the magazine into the enterprise CMS. Some magazine features that didn’t meet corporate security and IT conformance were lost. The magazine’s look and feel changed because the enterprise CMS “can’t do that.” The audience promotion and development plan, along with the analytics plan, were sidelined. Then, a new CMO joined the firm, and budgets were put on hold. Her first order of business was to change the corporate brand architecture, and subsequently the website design. All sections of the website (including thought leadership) were part of that redesign. And, they would innovate by upgrading to the newest version of the enterprise CMS, which included marketing automation and personalization capabilities. Once again, the audience promotion and measurement strategy had to wait. The content marketing team spent a year re-platforming the magazine yet again. As it turned out, personalization took the budget too high, so even after hundreds of hours of planning and architecting, the personalization part of the solution would be phase two for the magazine. In June 2017, the team quietly celebrated. It successfully relaunched the magazine as one of the website’s phased releases. Gone was the original magazine design and in its place the new magazine section looked much like the corporate website. There wasn’t enough time or budget to create templates to match the magazine’s original design or features. As it turned out, the upgraded CMS was more complex to use. The content marketing team now spent hours instead of minutes preparing posts. New workflow rules required posts go through extra regression testing through IT, taking publishing from days to weeks. The cadence slowed to a crawl. Subscriber growth stalled. The team now spent 50% of their time working in the technology, managing digital assets, addressing the new configurations, looking at personalization features, and trying to integrate enterprise analytics. In February 2018, three months shy of its 5th birthday, the financial services company’s digital magazine was killed. The content marketing team was restructured, and the content marketing director left the company. Content marketing, as a tactic, remains at the company. It is simply a handful of writers creating “investor outlook” PDFs emailed to clients and tracked through the enterprise CMS. (A)s IT software and infrastructure age, and as more features are added to legacy systems, technical debt grows and puts additional fixed operating costs on the company, diverting precious investment in innovation and new capabilities. In marketing, the issue is more pronounced. In a recent study, half of marketers (50%) say “too many technologies” is their top frustration, followed closely by “integrating technologies” (49%). The average number of marketing software technologies in a company is 16 and ranged as high as 98 in larger organizations. Is it any wonder that 80% of marketers say their least favorite thing is “learning and using new marketing technologies”? In most cases, the primary challenge is the inability for the business to move quickly due to the old, legacy systems that are patched, upgraded, and hacked together to try and keep up. However, the marketing challenge has an added burden. Many content and digital marketing teams seem perpetually stuck in a software selection or implementation cycle. The net result is either a blindside by corporate IT strategies (as in the above story) or digital content marketing strategies that look at the landscape of marketing technologies, asking “how can we learn how to do that?” The sad truth is teams never “learn to do that” because just as they start, some new technology implementation awaits around the corner. In short: Marketers continue to make the minimum interest payment on the technology debt that grows every day. It’s critical to create and maintain an early, often, and honest discussion with both the CMO and CIO about the view of the customer’s journey. The word “alignment” gets thrown around a lot when the relationship of the CIO and the CMO are discussed. But success or true alignment is not built from a mutual understanding of separate agendas. Rather, the technology and marketing teams must come together to develop a single collaborative strategy for customer/audience engagement. Put simply, managing a portfolio of content-driven media experiences should not be focused on pulling people through some singular technology-driven buying path or journey. Rather, companies should look to decouple customer/audience data management, and experience presentation and management, and optimization of those experiences. I spoke to this approach and a new way of selecting technologies in the keynote talk at CMI’s Content Tech event this year. Data by its definition has no meaning. It is a collection of facts, figures, and attributes about people or their behavior. To make data meaningful, businesses must develop new strategies to find the emotional value in data that is given rather than gathered. Focusing on connecting interactive experiences is critical. I wrote about this last year in CMI’s original research report: The Symphony of Connected Interactive Content Marketing. Much has been made about the need for marketing departments to be more agile, but it’s not necessarily about moving faster. The inability to find the calm in the chaos and the constant pressure of more capability are due to a fear of moving too slowly. 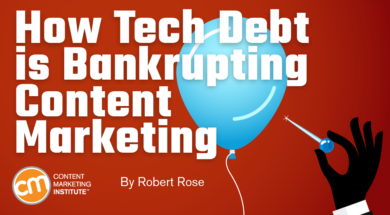 Rather, a reinvented content marketing team can find joy and reduce technical debt in the balance of creating strategic, customer-centric experiences that evolve customers and reorienting to more agile strategies. I’ve written quite extensively about what we call “content creation management” and some organizational thoughts – most notably outlining a process for content marketing to take root. Ultimately, marketers cannot measure themselves by how fast they can deploy new technology. That’s like saying that you can get out of debt by purchasing more, less expensive cars. You not only accrue more debt, you spend all your time learning how to drive all the cars you have. There is simply no way to accurately predict what the content marketing organization will need to look like in five years. It’s only been 10 years since any business could even think about how to address such media disruptions as Facebook, or the iPhone, or Android. It’s been less than two since we started talking about voice-activated search. What will the next five years bring? Who knows. Virtual reality? Artificial intelligence? Pokemon Go round two? Instead of looking at each new enabling technology (hardware or software) as a need for a new innovative capability or team, node on a matrixed structure, or even a weed that needs to be pruned in your legacy garden, marketers should look at structures where collaboration, content, and data flow more fluidly to handle any new disruption that threatens the focused strategy. To get out of technical debt, content marketing organizations absolutely need to be built to change – constantly. You need to deploy technology nimbly and decouple from the mother ship of legacy systems. CMOs and CIOs should stop trying to figure out what content and marketing should change into and focus on giving content and marketing the ability to change. That would be a huge down payment on the principal of our technical debt. Get more insight from CMI’s chief strategy advisor and other experts in content marketing to help you avoid tech debt and other challenges to your content marketing program. Register today for Content Marketing World Sept. 4-7 in Cleveland, Ohio. Use code BLOG100 to save $100.